The Jungfrau ski region in Switzerland is historic and super scenic, ideal for a family ski holiday given the vast ski terrain that encompasses four Swiss ski towns – Grindelwald, Wengen, Lauterbrunnen, and Mürren, and three ski areas with 213 Kilometer of ski trails. Grindelwald-First, Kleine Scheidegg-Männlichen and Mürren-Schilthorn all offer spectacular scenery of the Swiss Alps and the three towering peaks Eiger, Mönch and Jungfrau above 13,000′ in elevation. The Jungfrau is a Top Swiss Ski Destination. Grindelwald First is a great mountain for family skiing with over 40 miles of prepared slopes all offering magnificent views of the Swiss Alps served by a long gondola from Grindelwald village to the upper mountain ski slopes. Grindelwald-First ski slopes offer miles of intermediate trails, wide-open family friendly terrain usually in the sun with dramatic views of the “home-mountain” Wetterhorn and The famous Eiger North Face. The four-stage gondola from Grindelwald village can get very busy on weekend and holidays in the morning (maybe nearly an hour wait), but once you’re up on the slopes, skiers spread out among the chairlifts and T-Bars to Oberjoch and Schilt. Kids will love Grindelwald’s “White Elements” snow terrain park, the Skier Cross Park, and the First Flyer zip-line style high flying adventure from the top of First to Schreckfeld – this aerial adventure is included in your lift ticket. Grindelwald also has the world’s longest sled run, 15 kilometers on a wooden runner sled. You take the Gondola to Grindelwald – First, then hike two hours to Faulhorn at 8,812′ where you start your long, scenic, exciting descent (some walking, especially if you fall) on a groomed sledging run past signs, winter hikers, farms, and mountain chalets. Grindelwald village is busier and not as Swiss charming as the Jungfrau ski villages of Wengen and Murren, but with more ski chalet rentals and hotels, it can be more affordable for families and you can drive your car here or take the train. Kleine Scheidegg-Männlichen ski slopes are in the center of Jungfrau’s skiing above Grindelwald on one side and Wengen on the other. This Jungfrau ski area offers skiers modern ski lifts and 110 kilometers of red and blue prepared trails for intermediate and advanced skiing. Wengen is home to the world-famous Lauberhorn World Cup Downhill that begins at 8,111′ and descends 4.2 kilometers all the way to Trummelbach near Wengen. Kids will like skiing the World Cup Lauberhorn race course, timing their Downhill run to the finish arena or skiing the BMW Speed Check. 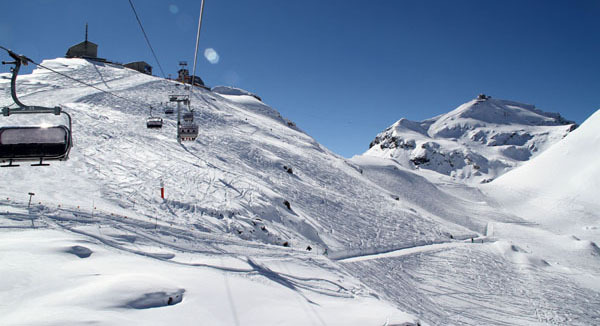 Wengen’s ski slopes also offer Snow Parks and some powder just off the prepared trails. To venture off piste, you should hire a mountain guide, there are some amazing pitches and powder fields like The White Hare, which can be hairy, steep, and dangerous if you don’t know the terrain or snow safety. What’s most remarkable about skiing at Kleine Scheidegg is that you are below the Eiger’s famous North Face. Many mountainside chalets are open for Swiss lunch, all with phenomenal scenery. We recommend the Eiger Glacier restaurant behind the Junfraujoch train station for its stunning views of the glaciers and delicious pastries and chocolates made at 7,612’. Staying in Wengen village is a Swiss dream, reached only by train – this lively ski town has great hotels all with amazing views, Swiss jewelry and ski shops and restaurants, plus an ice rink in the center and kids programs. Mürren-Schilthorn ski region is the highest in the Jungfrau, with the Schilthorn summit at 9,744′. Most famous for the filming of James Bond movie, “Her Majesty’s Secret Service”, you must head to the top by Cable Cars to the Piz Gloria to see the amazing mountaintop lodge with a revolving 360 restaurant and the 007 James Bond World exhibit. After an hour long rotation over the most scenic lunch ever, you will be excited to ski like Bond down the steep slope from the top. Unless you are an expert skier you will want to download from the summit as there is just one prepared trail off the summit and it is a black diamond descent. Skiing at Mü rren Schilthorn covers 54 kilometers of prepared ski slopes with spectacular views of over 200 alpine mountains. Trains, cable cars, a tram and several chairlifts serve fun, undulating terrain as you find yourself skiing through valleys, farm pastures, by Swiss chalets. Tell the kids about The Inferno Race which started on the Schilthorn in 1928 and continues to this day, the world’s longest downhill 10 miles from the summit to the base in Lauterbrunnen in about 15-minutes. The mountainside village of Mürren is as charming as you will find anywhere. The car free village has just a few Swiss hotels, quiet and quaint, just steps from the ski slopes, cable cars and train. 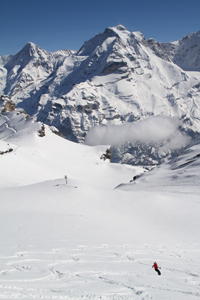 The Jungfrau region of Switzerland makes for an amazing family ski adventure. These Swiss Alps are the most beautiful place to ski in the world, with great ski hotels in Wengen and Murren. Asians come just to snap photos – they ride the trams and trains, but not the ski slopes. There is so much terrain and striking scenery, and the Swiss food and tradition is delightful. Jungrau is Swiss-German but most everyone speaks English and is very friendly to families. Put Jungfrau on your family ski trip list. Jungfrau Stats: 9,744′ highest summit at Schilthorn, 6,888′ vertical, 44 lifts connecting four Swiss towns with gondolas, cable cars and trains, 224 kilometers of trails. Traveling to The Jungfrau: Fly into Zurich, take the Train to Lauterbrunnen, then Grindelwald, Wengen or Műrren, about 2 hours.